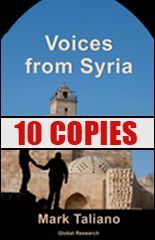 Global Research Publishers brings you “Voices from Syria”, an important book by Mark Taliano. The book is available for order on our online store. 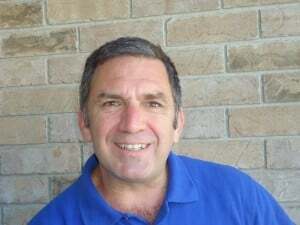 Mark Taliano is an author and independent investigative reporter who in 2016 travelled to Syria with the Third International Tour of Peace to Syria. 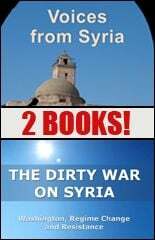 In this book, he combines years of research with on-the-ground observations to present an informed and well-documented analysis that refutes mainstream media narratives about the dirty war on Syria. Now that the West has injected terrorists into the country and imposed illegal sanctions on Syrians, the war-torn country and its people are mostly defiant. The future of the country is theirs to decide, as per international law, and they will not be colonized. Their defiance comes easily thanks to the Western-supported, illegal “opposition” that confronts them. None of the “opposing” terrorists are moderate. They slaughter Christians, minorities, and Muslims alike. They seek a blank slate upon which to impose their extremist Wahhabi ideology, and they seek to erase both Syria’s history and its people. Historical memory teaches us that the West’s use of proxy mercenaries is not new. The West has destroyed a series of countries in quick succession since 11 September 2001 (9/11), including but not limited to Afghanistan, Iraq and Libya, all by design, and always aided and abetted by mercenary ground troops. But Syria has strong institutions and strong allies. It will be victorious, to the benefit of Syrians and humanity. 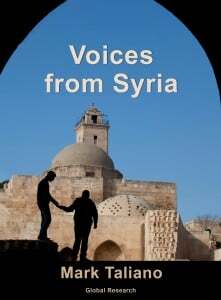 This book presents the story of Syria and Syrians as they struggle valiantly against NATO terrorism. The narrative contradicts mainstream messaging, as it must. The West and its agencies could never garner public support for their genocidal campaigns if the truth emerged and was acknowledged by a broad base. Truth leads to peace, but the governing polities that manipulate us and contaminate the public mindset enrich themselves through war, mass slaughter, and propaganda campaigns. Truth and justice are their unstated enemies. This book aims to shed light on truth, justice and governing lies, with a view to expanding the reach of global peace and destroying the cancer of terrorism. We initially recount the story of Syria as told by Syrians, unfiltered by mainstream media propaganda. We see and hear the trauma lived by defiant, heroic Syrians, and we discover that this ancient, holy land will surely survive the current barbarian invasion to rise again as a beacon of civilization, hope, and dignity. 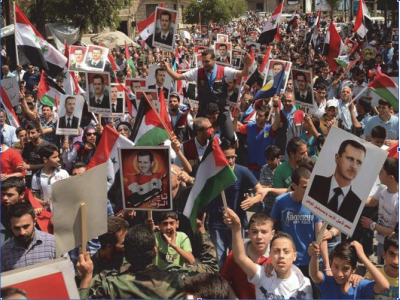 The externally orchestrated war is being resolved internally – by Syrians, for Syrians –and the solutions are often the fruit of genuine democratic processes, in contrast to the processes masquerading as democracy in the West. Syria insists on being a sovereign nation. We subsequently elaborate upon the real story of Syria and the drivers behind the current war, in which the US-led Empire is using terrorist proxies to advance its reach, contrary to the wishes of the vast majority of Syrians. The alternative to Syria’s elected government is genocidal despotism and sharia law. The (non-existent) “moderates” cannot be separated from the “extremists” because all of the mercenary terrorists share the same goals and the same ideologies. Between 15 and 23 September 2016, I travelled to war-torn Syria because I sensed years ago that the official narratives being fed to North Americans across TV screens, in newsprint and on the internet were false. The invasions of Afghanistan, Iraq, and Libya were all based on lies; likewise for Ukraine. All of the post-9/11 wars were sold to Western audiences through a sophisticated network of interlocking governing agencies that disseminate propaganda to both domestic and foreign audiences. But the dirty war on Syria is different. The degree of war propaganda levelled at Syria and contaminating humanity at this moment is likely unprecedented. I had studied and written about Syria for years, so I was not entirely surprised by what I saw. What I felt was a different story. Syria is an ancient land with a proud and forward-looking people. To this ancient and holy land we sent mercenaries, hatred, bloodshed and destruction. We sent strange notions of national exceptionalism and wave upon wave of lies. As a visitor I felt shame, but Syrians welcomed me as one of them. These are their stories; these are their voices.